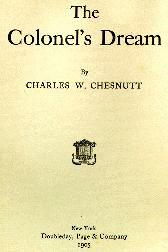 Charles Waddell Chesnutt, 1858-1932 The Colonel's Dream. Southern States -- Economic conditions -- Fiction. Southern States -- Social conditions -- Fiction.